Partnerships are believed to tackle the most pressing societal challenges, including food security and climate change. However, while partnerships are often presented as a solution for addressing global problems, they frequently come with difficulties, for instance differing agendas and language use. The CGIAR Research Program on Climate Change, Agriculture and Food Security (CCAFS) increasingly works in partnerships with other organizations, which begs the question of how CCAFS addresses the issues and challenges that come with it. 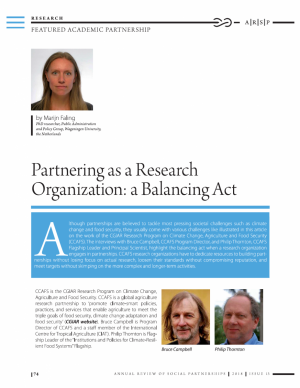 For CCAFS, partnering as a research organization is a rewarding undertaking, while it is also a continuous balancing act. Marijn Faling, Research Fellow working on Partnerships and Inclusive Development with the Partnerships Resource Centre (PrC) at the Rotterdam School of Management, recently published an interview with Bruce Campbell, CCAFS Program Director, and Philip Thornton, Flagship Leader and Principal Scientist, in The Annual Review of Social Partnerships. The interview reveals that partnering is rewarding, mostly because scientific data does not automatically translate into changes on the ground. Collaborating with local partners helps to translate findings into action, safeguard local relevance of activities and research and bring together different and complementary resources from different partners. Simultaneously, the article explains how partnering is a balancing act. CCAFS has to dedicate efforts to building relationships and aligning agendas among partners, without losing focus on conducting research. As CCAFS frequently collaborates with organizations holding a lower appreciation for scientific data, CCAFS has to loosen their rigid scientific standards without compromising their high-valued reputation. Finally, CCAFS has to meet short-term tangible targets without losing focus on complex results taking longer to occur. The conversation with Campbell and Thornton demonstrates that partnering becomes more feasible and workable when taking into account various matters. Most importantly, a certain level of flexibility and strategy is required. Extra transaction costs need to be factored in to account for relationship building and dissemination of findings. Strategic selection of partners and individuals within organizations facilitates team spirit and enables complementarity of knowledge, while trust and good relationships facilitate the streamlining of goals and preferences. The Partnerships Resource Centre (PrC) is an international research and knowledge center on public-private collaboration for sustainable and inclusive development. Embedded within the Rotterdam School of Management (RSM) of the Erasmus University, the flagship centre bridges science and practice. The PrC’s Knowledge Agenda focuses on: creating knowledge to enhance the transformative capacity of partnerships, connecting academic and practical knowledge to support mutual learning, and sharing knowledge to guide navigation and strategizing processes of partnering. See for more information: www.rsm.nl/prc.